Automakers use an AdBlue urea solution injected into the exhaust-gas stream to reduce NOx emissions. 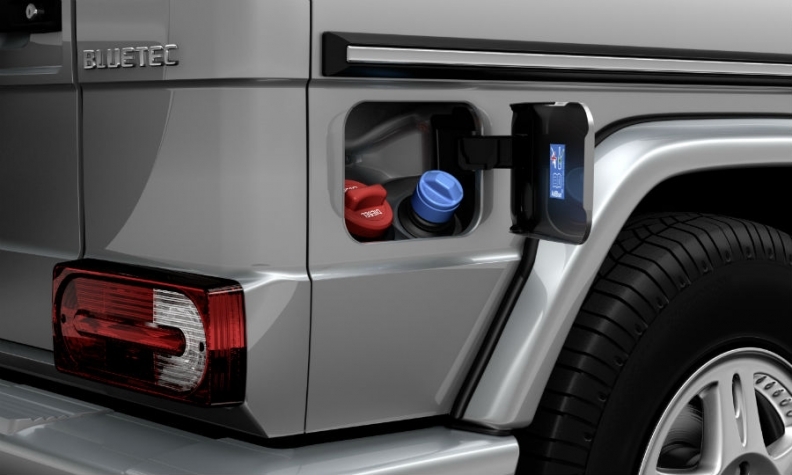 The Mercedes G class BlueTEC version has an AdBlue filler cap next to the fuel cap. BRUSSELS -- EU antitrust regulators are investigating allegations of a cartel among German automakers, a measure that could result in hefty fines for the companies. "The European Commission and the Bundeskartellamt have received information on this matter, which is currently being assessed by the Commission. It is premature at this stage to speculate further," the EU executive said on Saturday, without giving more details. The automakers discussed their choice of suppliers and the price of components. Since 2006, the carmakers have also discussed the cost of AdBlue, an exhaust emissions treatment system for diesel engines, the magazine said. They discussed details such as the sizing of tanks for diesel emissions treatment fluid and they agreed to use smaller rather than larger ones, Der Spiegel said. BMW, Volkswagen and Daimler shares fell in early Monday trading, weighed down by uncertainty over possible antitrust fines. Shares in VW were down 3.3 percent, with rivals Daimler and BMW down 2.9 percent and 2.5 percent respectively, underperforming the blue-chip DAX index, which was 0.4 percent lower. Exane BNP Paribas automotive analyst Stuart Pearson said little was known about the allegations, and that no signs had emerged about price fixing towards the consumer. Allegations will, however, continue to weigh on stocks, he said. "More ugly details could yet emerge, leaving German manufacturers - and the EU auto sector - still firmly in the sin bin for now," Pearson said. The auto industry has been hit with billion-euro fines in Europe and the U.S. in recent years for cartels related to various parts such as lighting systems, engine coolers and bearings.